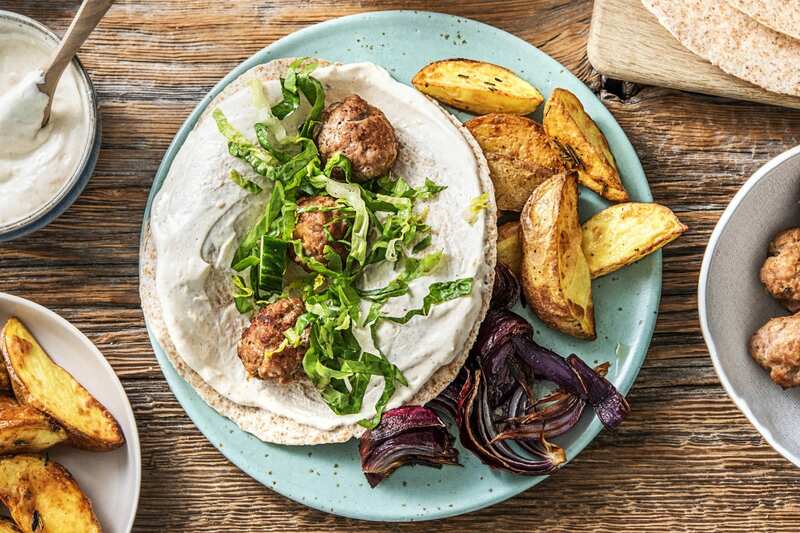 If you’re looking for a speedy recipe with plenty of flavour, these delicious meatball wraps make a great quick-fix dinner. 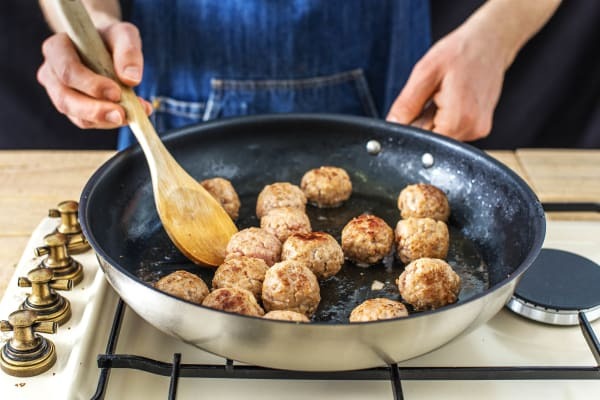 As we’re always looking for clever ways to cut down time in the kitchen, our pork suppliers have perfectly seasoned the sausage meat so that you don’t have to! When everything is ready to go, place all the ingredients in the middle of your table and get everyone to build their own wraps exactly how they want them. Fast food at its finest! Preheat your oven to 200°C. Chop the potato into 2cm wide wedges (no need to peel). 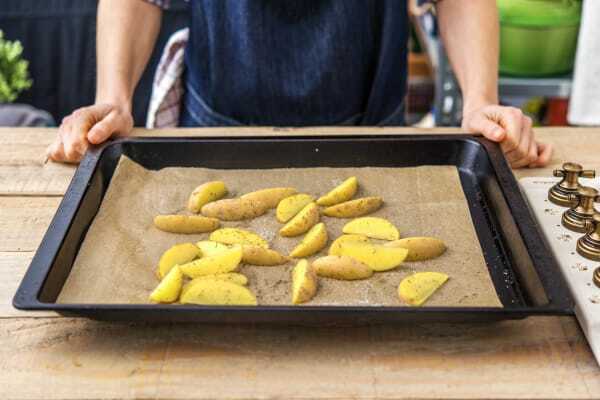 Pop onto a lined baking tray. Pick the rosemary leaves from their stalks and roughly chop (discard the stalks). Drizzle a splash of oil onto the wedges and sprinkle on the rosemary and some salt and pepper. Use your hands to rub the flavours all over the wedges. Roast on the top shelf of your oven until golden, 25-30 mins. Turn halfway through cooking. Halve and peel the red onion, then chop each half into 4 wedges. Add these to the wedges when you give them a turn. Peel and grate the garlic (or use a garlic press), zest then halve the lemon. Pop the sausage meat into a mixing bowl and add the garlic, half the lemon zest and half the paprika. Mix well with your hands and shape into 4 balls per person. Transfer to a plate as you make them. IMPORTANT: Remember to wash your hands and equipment after handling raw meat. Heat a splash of oil in a frying pan over medium-high heat. When the oil is hot, add the meatballs. Brown all over, as evenly as possible - 2 mins per side then lower the heat to medium and cook until the meatballs are no longer pink in the middle. This will take 15-20 mins. 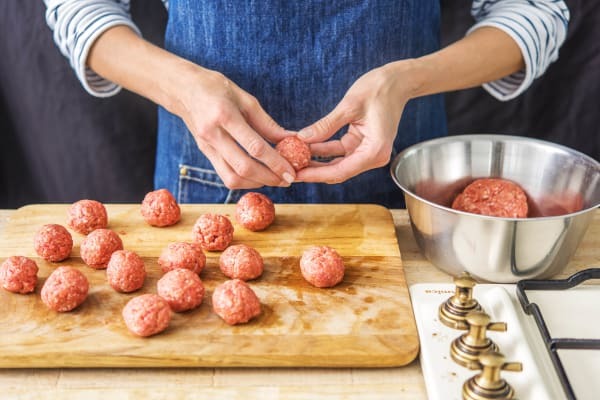 Turn the meatballs every 2 mins to make sure they don't burn. 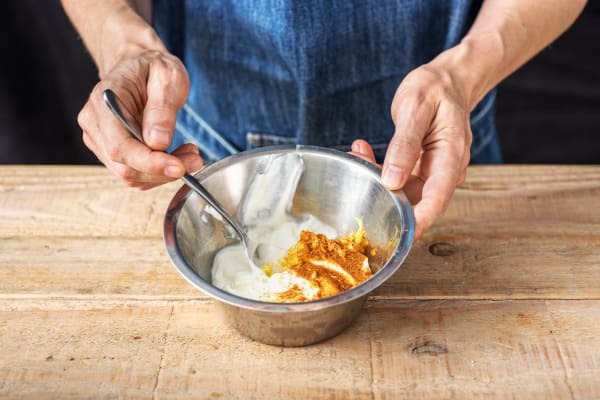 Meanwhile, shake the Greek yoghurt pouch and squeeze into a small bowl. Season with salt and stir in the remaining lemon zest. Mix well and add a pinch of the remaining paprika. Taste and add more paprika as necessary. Keep to one side. Trim the cucumber then quarter lengthways. Chop witdthways into small pieces. Trim the root from the baby gem lettuce then halve lengthways and thinly slice widthways. Pop into a large bowl and season with salt and pepper. 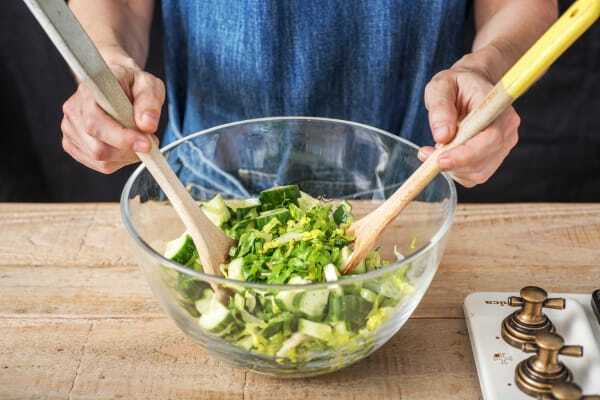 Just before serving, dress the salad with a squeeze of lemon juice and a splash of olive oil and toss well. When you are nearly ready to serve, warm the tortillas on a baking tray on the middle shelf of your oven for 2 mins. Place everything in separate bowls on the table and let everyone build their own wraps. 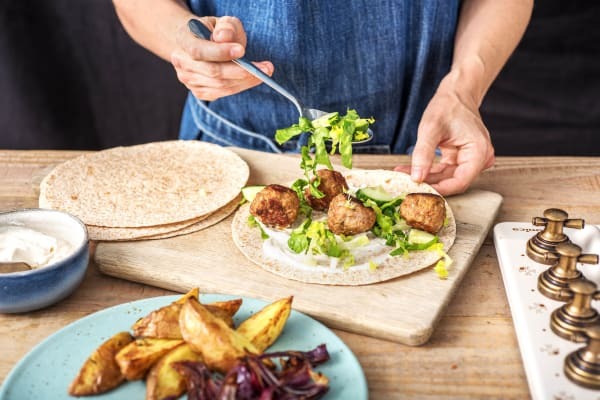 We recommend smearing a spoonful of yogurt dip on the tortilla before topping with the meatballs and some salad and then folding! Serve the wedges alongside. Enjoy!